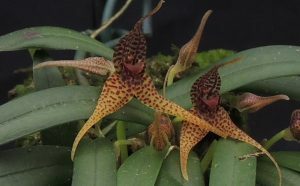 It is fortunate that the students in Orchid Project are observant or we could miss some spectacular events like the flowering of this miniature species. 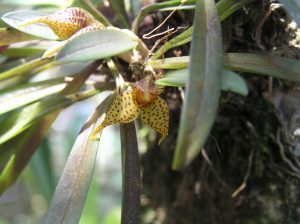 The dryadellas were growing on the lower trunks of stunted trees in elfin forest near a ridge at around 1200m altitude. 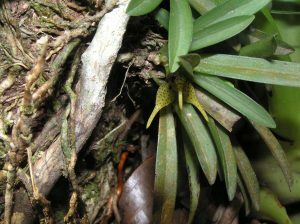 The trees had a number of orchids on them including maxillaria species and pleurothallis species, and the dryadellas were growing below these other orchids and some of them growing very low light as shown in the photos taken in Brazil (Below). We find plants do best for us mounted but then grown in heavy shade on a north facing wall and sprayed daily. 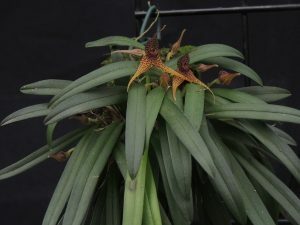 The flowers are long lasting and small can produce a lot of flowers which stand well clear of the leaves but you need to keep your eyes open for the subtle flowers appearing between the leaves.